Nigerian farmer, photographed by Fagg in 1960. Published in: Fagg (B. ), “Nok terracottas”, Lagos, 1977: p. 27, fig. 21. 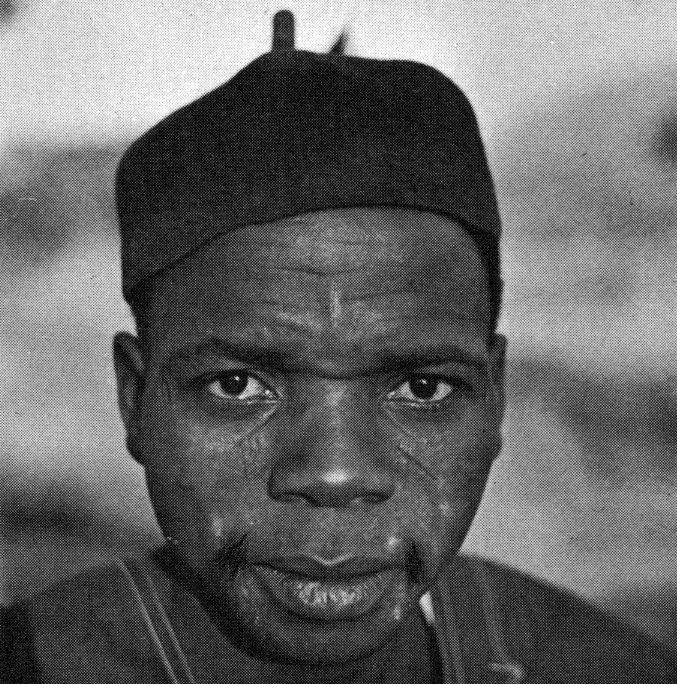 I recently came across the above field-photo of a Nigerian farmer taken by the British archeologist Bernard Fagg in 1960. His incentive to photograph this man is rather interesting. 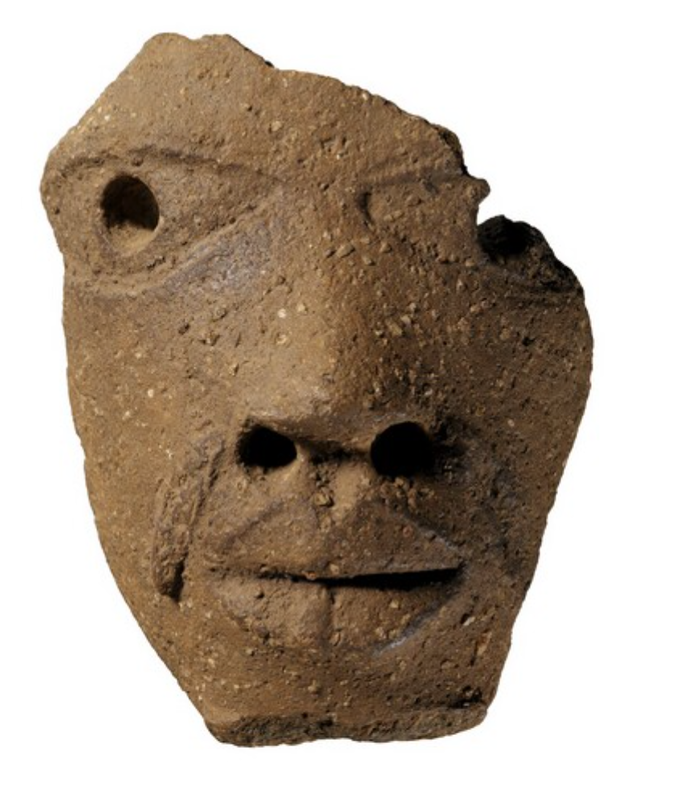 Fagg must immediately noticed that the farmer’s moustache, represented by two small projecting tufts at the edges of the upper lip, in fact is a typical feature of many male terracotta “Nok” heads he had previously discovered in the region – see an example below. The Nok culture, which blossomed from 900 B.C. 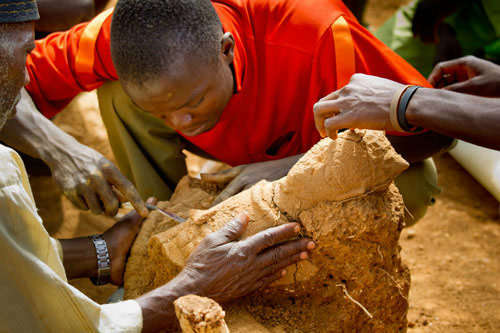 to A.D. 200, is sub-Sarahan Africa’s earliest known sculptural tradition. Unfortunately, little is understood about how this civilization ended. Bernard Fagg wrestled his whole career with two important questions: Where did the Nok culture come from ? And where did it go? 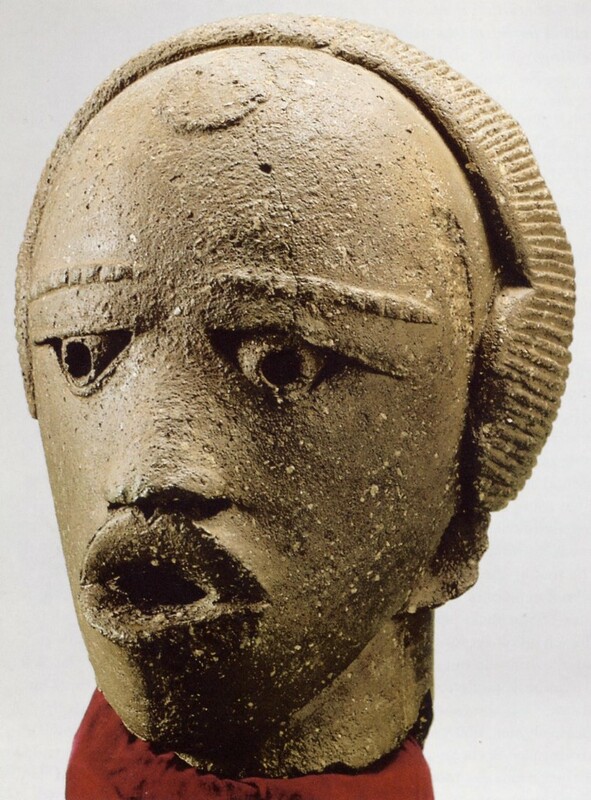 Spotting this farmer’s moustache must have certainly gave him hope in his wish to establish a stylistic continuum between Nok and the later Nigerian civilizations. Nok head (Nigeria). Height: 15,5 cm. Ex Collection Musée Barbier-Mueller. Image courtesy of the Musée du quai Branly (73.1996.1.1). This entry was posted in Research and tagged Field-photo, Nok on April 1, 2015 by admin. With its exhibition Nok. 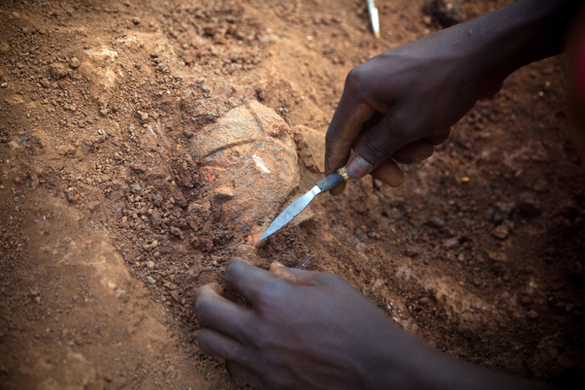 Origin of African Sculpture, running from 30 October 2013 to 23 February 2014, the Liebieghaus Skulpturensammlung presents over one hundred sculptures and fragments excavated in Nok territory by the archaeologists of Frankfurt’s Goethe University. They will be displayed in a dialogue with objects from Ancient Egypt and Greek-Roman Antiquity from the collections of the Liebieghaus. More info here and here. A comprehensive catalogue will be published by Africa Magna Verlag to accompany the exhibition (c. 292 pages, c. 170 color and 55 black-and-white illustrations as well as 51 plates). I am very curious about the research results of this long-term (8 years to be exact) excavation project of Frankfurt’s Goethe University. Besides the very few scientific studies after Fagg’s pioneering efforts (Fagg 1972, Jemkur 1992, Tylecote 1975), it are the first seriously documented excavations ever. Peter Breuning’s article in the autumn 2012 issue of Tribal Art Magazine definitely awakened my interest. It, for example, clearly stated that not one of the excavated terracotta figures was found intact – quite a contrast with what one tends to encounter in galleries. 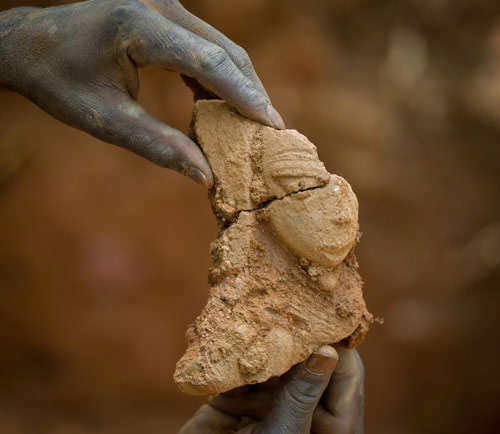 Excavation of a landfill and recovery of large parts of sculptures of the Nok culture. Photo courtesy of Goethe University Frankfurt. Nok sculpture – Fragment of a human torso, Terracotta, 1000 BC. 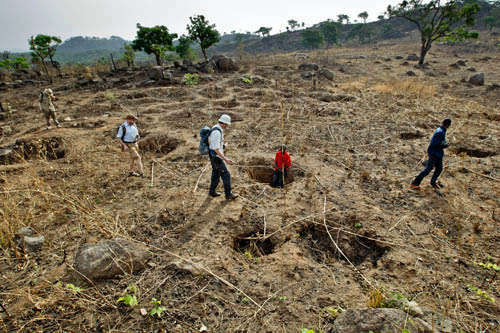 Dogon Daji in Nigeria, excavation in 2011. Photo courtesy of Goethe University Frankfurt. Illegal excavation site. 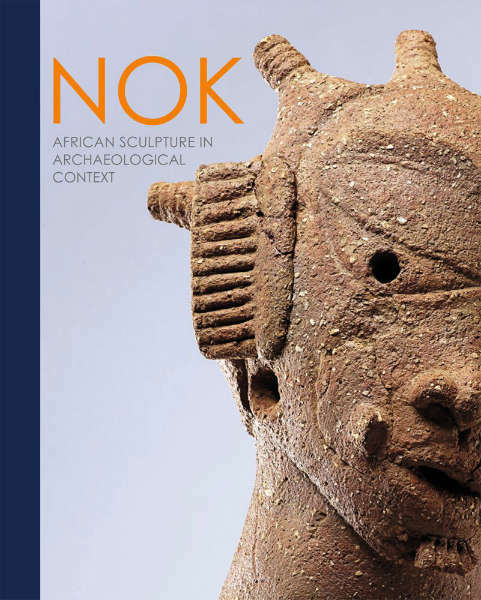 Looters ransacked the ground after Nok sculptures. Such sites are easy to find because the holes are not filled. Photo courtesy of Goethe University Frankfurt. This entry was posted in Exhibtions and tagged Nok on October 18, 2013 by admin. This entry was posted in Objects, Research and tagged Nok on June 6, 2013 by admin.